Monday, April 1st ~ Bells, 7 pm. Tuesday, April 2nd ~ Prayer Shawl, 1-3 pm. Choir 7 pm. Wednesday, April 3rd ~ Soup Supper, 6 pm and Lenten Service at Christ UCC, Trumbauersville, 7 pm. Sunday, April 7th ~ Worship in the Parlor, 8 am. Sunday School, 9 am and 10:15 Worship in the Sanctuary. Monday, April 8th ~ Bells, 7 pm. Tuesday, April 9th ~ Consistory, 7 pm. 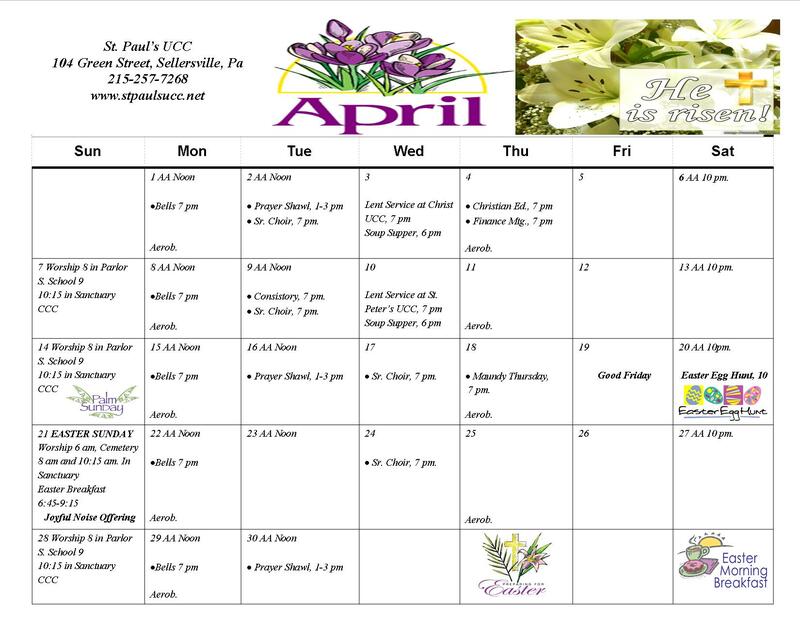 Wednesday, April 10th ~ Soup Supper, 6 pm and Lenten Service at St. Peter’s UCC, Tohickon, 7 pm. Sunday, April 14th ~ Worship in the Parlor, 8 am. Sunday School, 9 am and 10:15 Worship in the Sanctuary. Palm Sunday. Monday, April 15th ~ Bells, 7 pm. Tuesday, April 16th ~ Prayer Shawl, 1-3 pm. Wednesday, April 17th ~ Choir, 7 pm. Thursday, April 18th ~ Maundy Thursday, Tenebrae Service, 7 pm. Saturday, April 20th ~ Easter Egg Hunt for children ages 0-5th grade, 10 am. Sunday, April 21st ~ Easter Sunday ~ Easter Breakfast being served in Fellowship Hall from 6:45 am until 9:15 am. 6 am. Sunrise Rise Service in Sellersville Cemetery, 8 am. Worship in Sanctuary, 10:15 am. Worship in Sanctuary, Sacrament of Holy Communion at both 8 am and 10:15 am. Joyful Noise Offering to be collected. Monday, April 22nd ~ Bells, 7 pm. Wednesday, April 24th ~ Choir, 7 pm. Sunday, April 28th ~ Worship in the Parlor, 8 am. Sunday School, 9 am and 10:15 Worship in the Sanctuary. Monday, April 29th ~ Bells, 7 pm. Tuesday, April 30th ~ Prayer Shawl, 1-3 pm. You can call (215-257-7268) or send email (secretary@stpaulsucc.net) and place your order with Stacey, who will get the order to the right person. We’re delighted you enjoy the pot pie dinner.